Tech head coach MaChelle Joseph stated that the final moments of the game were defined by Virginia’s ability to step up when it mattered most and Tech’s struggle to do the same, courtesy of ramblinwreck.com. Sophomore Francesca Pan carried the Jackets throughout the game, leading Tech at the free throw line and finishing the game with a total of 25 points. The Jackets shot 34.4 percent, while Virginia shot a slightly higher 43.8 percent. The ACC tournament concluded on March 4, with Louisville defeating Notre Dame 74-72 in yet another nail-biter of a game. Following Tech’s disappointing second-round loss in the ACC tournament, questions are being raised as to whether or not Tech will receive a bid to the Women’s National Invitation Tournament. The complete list of the 64 teams selected for the WNIT will be announced on the evening of March 12, and the first round of the tournament itself will kick off on Wednesday, March 14. Tech also lost out in the second round of the ACC tournament last year, but still managed to get a bid to the WNIT. Not only did they get a bid, they made it to the final round of the tournament before losing to Michigan 89-79 in triple overtime. 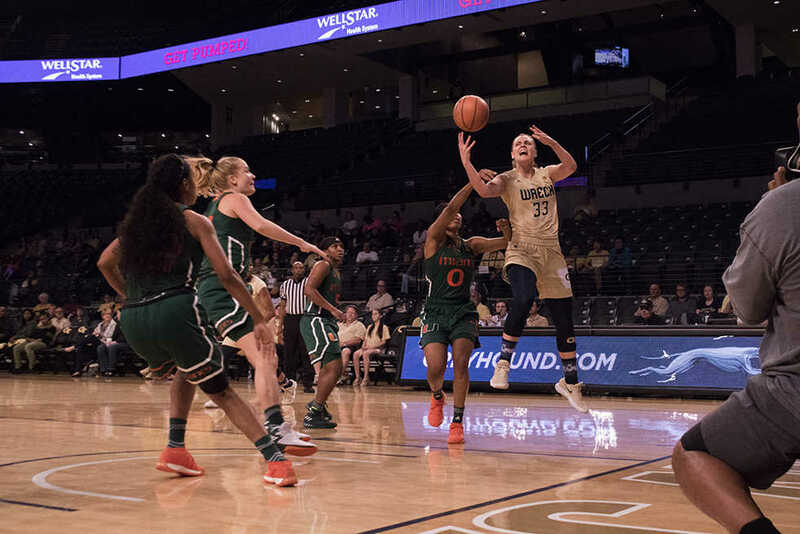 There is a solid chance that the Jackets will indeed receive another at-large berth invitation to the WNIT and another chance to win what they were so close to winning last year. In order to be considered for an at-large berth, a team must have an overall record of .500 or better. Last year before the WNIT, Tech had won a total of 17 games. This season, Tech is sitting on a winning 18-13 record and is just as qualified to receive a bid as they were last year, if not more. Assuming that Tech does get a bid to the tournament, the question remains of just how far the team will go. Do they have the talent to repeat the run they had last year? As far as talent goes, senior forward Katarina Vuckovic played in every game throughout the 2016-2017 season, averaging 26.4 minutes per game and 4.8 points per game. Though a quality player, Vuckovic’s absence will likely be compensated for by remaining key players such as sophomore guard Francesca Pan, redshirt junior forward Elo Edeferioka, senior forward Zaire O’Neil, senior point guard Imani Tilford and freshman guard Kierra Fletcher. In Tech’s 2017 WNIT semifinal appearance alone, both Edeferioka and O’Neil ended the game with 16 rebounds each; O’Neil ended the game with 20 points, Pan with 14 points, Tilford with 12 points and Edeferioka with 11. Though only a freshman, Kierra Fletcher had an impressive game against Virginia last week, helping to keep Tech in the game within the final moments. Fletcher is sure to be a promising asset to the team and an exciting player to watch in the future. The men’s and women’s NCAA Tournaments will garner great interest, and the men’s NIT will set the stage for a number of big-name programs having down years to do battle. The women’s NIT may lack the punch, but it will be a worthy final step. No, they will not get serious national attention unless they make the championship game for the second year in a row, but for young players like Kierra Fletcher and Lorela Cubaj, it is a valuable chance for experience against tough competition. For seniors like Zaire O’Neil and Imani Tilford, it is a farewell to college basketball and their time on The Flats.